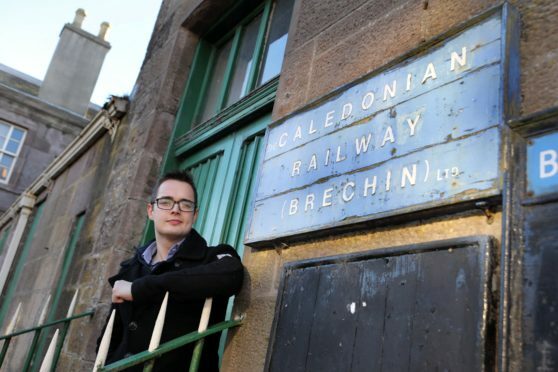 Braden Davy at Brechin Railway Station, is making a bid to bring back Beeching railways. Friends of the Earth Scotland is backing calls to get Beeching’s axed railway lines back on track in Angus. 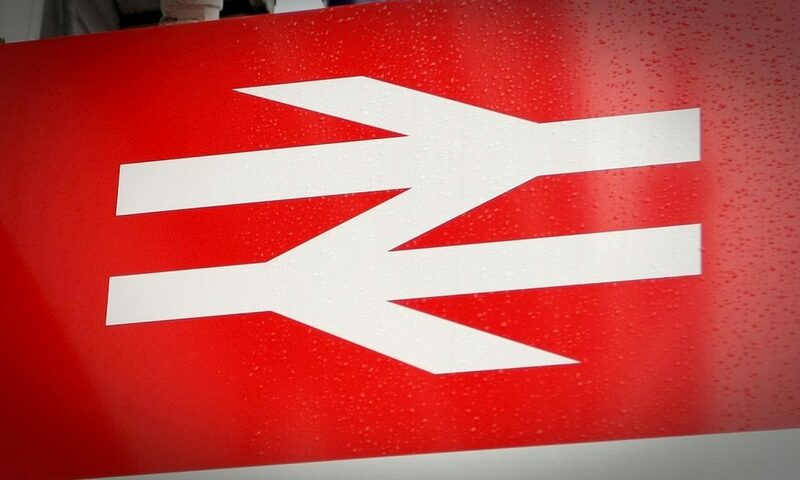 It is more than 50 years since Dr Richard Beeching’s report was published, spelling the end of more than 2,300 stations, and around 6,000 miles of railway line. Mr Davy believes the reopening of the lines would ease congestion, bring new jobs, cut carbon emissions and provide “a massive boost for Angus”. In the years since, groups from across the UK have been fighting to bring back their community’s rail links including reopening forgotten Angus lines to increase jobs and growth. 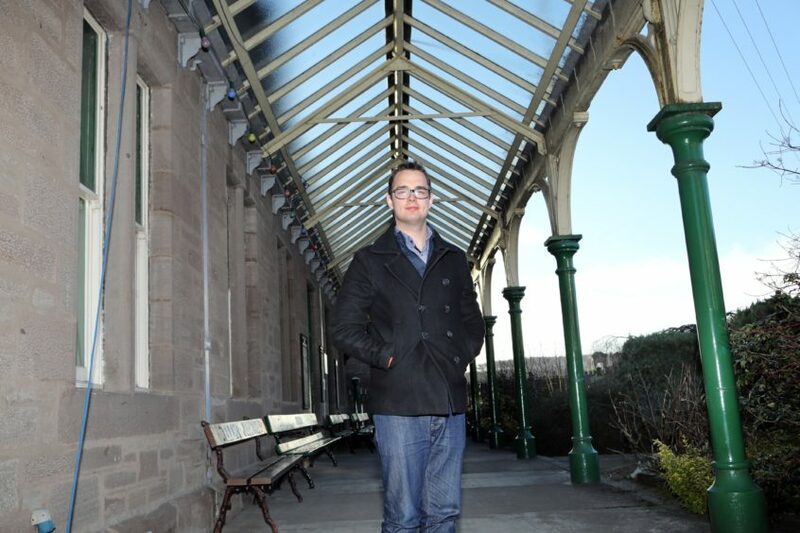 Forfar Conservative councillor Braden Davy called for Tay Cities region deal cash to be used to investigate a return of rail to Forfar and Brechin. Friends of the Earth Scotland air pollution campaigner Gavin Thomson, said: “It is time for an honest evaluation of the costs, environmental and health benefits that could be gained from re-opening local train lines and stations. “Restoring many of the train routes brutally closed by the Beeching Reports would mean better connected communities and aid our efforts to cut climate emissions by helping people leave the car at home. “The transport sector creates the most climate pollution in Scotland, largely due to traffic on our roads and its emissions have barely reduced since 1990. “Decades of political decisions geared towards increasing car use are damaging our health via air pollution and belching out emissions threatening our climate. Brechin closed for passenger traffic during the early 1950s but remained opened to freight traffic until final closure by British Rail in 1981. The Stanley-Kinnaber junction line closed in 1967 after Beeching published the second of his two reports that would change Britain’s railway system forever. When the 46-mile line closed, over two-thirds of it was initially retained. The 26 miles from Stanley to Forfar and the five miles from Kinnaber to Bridge of Dun and on to Brechin were both still in use into the 1980s. Forfar eventually lost its sparse freight traffic in 1982, Brechin having done so a year earlier. ScotRail Managing Director, Alex Haynes said: “The growth of the Borders railway is actually accelerating which means we are going to have to operate longer trains on this route and I think there is more growth to come as well. “In addition to bringing new investment, we can take cars off the road, ease congestions and reduce carbon emissions. “All of this while building links to Aberdeen, Edinburgh and Dundee. Angus and Mearns Matters: Is new idea for the likes of Auldbar on the right track?